After a diagnosis with Alzheimer’s in June 2011, Glen Campbell agreed to record one final album and perform one final tour. His story and the lyrics throughout Ghost On The Canvas have touched me deeply, as I lost my Gramps to Alzheimer’s 5 years ago on Nov. 12. Ghost On The Canvas is the last studio record of new songs that I ever plan to make. I’ve been saying it to my friends and family, but now that it’s in writing, it really seems final. I’ve done a lot in my life - played, sang, toured, hosted a TV show, acted in a movie - most of the things that happened were because of music, because of the records, and now it’s time to just close that book. to write songs specifically for me, and then Julian and I wrote some others. It’s really a series of snapshots of my life and career. And that life has been greater than I ever could have imagined. I was born in Billstown, Arkansas, one of 12 children. We lived on a farm where me and all of my brothers and sisters were expected to take care of the fields and the milking and the tilling - I got just enough farm work to know I didn’t want to do farm work! But I also got a guitar, and Uncle Boo was the first person to ever show me how to play one. I never learned to read music, I just always played by ear, and when my uncle gave me an opportunity to play on a radio show in Albuquerque, I was outta there! I learned a lot on the radio and in the clubs in New Mexico, and in just a couple of years, I moved to Los Angeles and landed with some of the best studio musicians in the world. Years later, they called us the Wrecking Crew - there were a bunch of us that played together in different combinations, and I got to work on a lot of the big records of the day: “Strangers In The Night” by Frank Sinatra, “Good Vibrations” by the Beach Boys, “Everybody Loves Somebody” by Dean Martin, “Viva Las Vegas” by Elvis Presley, “Surf City” by Jan & Dean, “Mama Tried” by Merle Haggard, “Hello Mary Lou” by Ricky Nelson, “You’ve Lost That Lovin’ Feelin’” by The Righteous Brothers. But that was just the start. When Brian Wilson stopped touring, I became a Beach Boy for about half a year, and by the end of the 1960’s, I got a chance to host a television show, The Glen Campbell Goodtime Hour. I performed on that show with a lot of people who made a mark of their own: Johnny Cash, Cher, Willie Nelson, Anne Murray, Ray Charles, Jerry Reed - it was really an amazing period. I also got to work with John Wayne on the original version of True Grit. Fortunately, the good times were much greater than the bad ones. And the songs - “Wichita Lineman”, Rhinestone Cowboy”, “Southern Nights”, “Galveston”, "By The Time I Get To Phoenix” - I’m still proud of all I got to do. All of my little rollercoaster ride - the laughter, the tears, the successes and the failures - are part of who I am now. 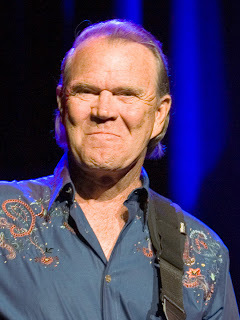 They helped create the Glen Campbell I am today, and that’s what Ghost On The Canvas is about. It’s the “now” Glen, with all the ghosts of the old Glens still kind of hanging around. In some ways, it’s a musical biography. But hopefully you’ll find a little bit of yourself in there too. Everything I have in this world is, in some way, connected to music. And I give it to you. Enjoy it. I made it with a smile. And a real sense of gratitude.